It reminded me of when the film came out long, long ago. I remember it like it was yesterday, because that was when I came to know of the perfidy of film critics. You may or may not remember that Michael Cimino, the director of Heaven's Gate, was also the director of The Deer Hunter, critics' darling and winner of Academy Awards. But critics hated Heaven's Gate. And their hatred extended into retrospect. A critic in Newsweek noted that the failure of Heaven's Gate cast doubt on the quality of The Deer Hunter, which seemed to me almost breathtaking in its cheek and also its nonsense. While I'm knocking film critics, let me say that I find it unbelievably annoying when a film critic in a national magazine, or website, or wherever they publish film reviews nowadays, gets plot details wrong. If I can remember the details, enough to know that the reviewer got them wrong, then they should be able to remember them, am I right? I haven't seen Heaven's Gate. So don't take my word for anything. But it pleased me endlessly to see this article, to think that the film would get a second chance and a reconsideration. What would please me more would be if that Newseek critic would apologize for his sheer effrontery, from long long ago. In fact, I would like there to be a ceremony for this kind of retraction. It could be an annual event, and there could be an official board to review the proposed occasions for this kind of egregious malpractice of the critical arts. It would right wrongs, redress grievances, and restore balance to The Force. I saw 'Heaven's Gate' many years ago but remember little about it. I do remember thinking that it was huge, ambitious, and beautiful, and not terrible. This movie, besides being the death knell for United Artists, also signaled the near-end of auteur cinema, certainly the end of the 70s auteurs, and the idea that you could or should put huge sums of money behind the single creator of a film. 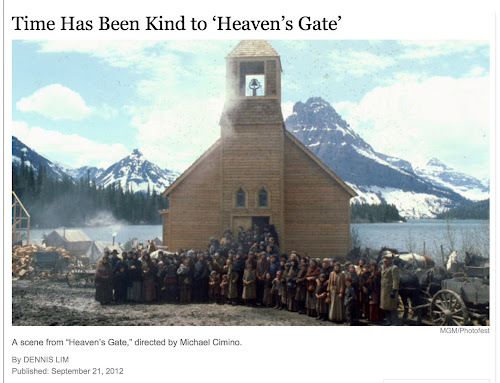 A movie like 'Heaven's Gate' would never be made today, and for that reason alone it should be watched. I think this movie is partly responsible for why films are directed by committee these days, and if somebody wants to make an art film, they can do so, but it has to be under a few million dollars. Not only is this film a time capsule of the Old West, it's a time capsule of what kind of filmmaking used to be possible. Cimino made 'Year of the Dragon' and three or four complete duds after 'Heaven's Gate.' I don't know if he is a good filmmaker. But I would much rather watch an inspired failure than another episode of Special Victims Unit. I think this is an excellent idea. Someone needs to pay you to do this. Watch movies then review them.